We couldn’t be more thrilled to share this contest with our amazing fans each month. You can enter to win our January prize bundle (detailed below) on our original Instagram post, found here. It’s no secret that we at ChooMee are huge fans of FRESH!… and for very good reason. A child’s success depends on key factors including optimal fuel, loving relationships, positive experiences, and a nurturing environment. Babies undergo an amazing transformation from birth to age three and nutrition plays a vital role in healthy brain development. We’re now learning how the experience of reading exposure also has measurable affects on baby’s behavior and academics throughout life. It provides them valuable bonding time to establish a meaningful association with books and critical cognitive stimulation. Even if they don’t understand what the heck you’re reading about, your vocabulary, tone, and rhythm of your voice BOOST their little brain power! 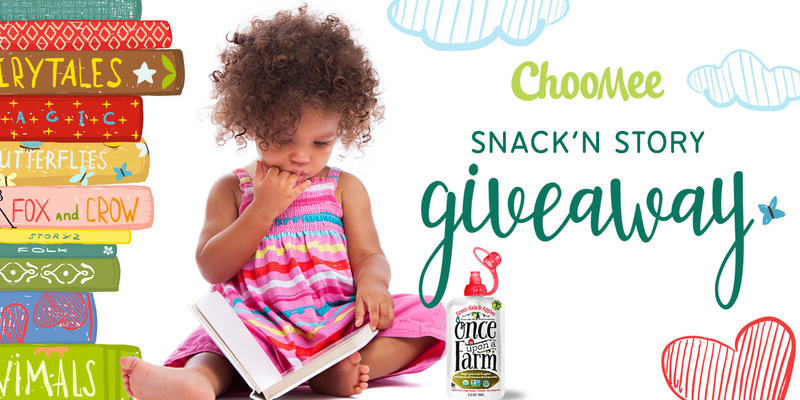 Our Snackn Story Giveaway was designed to educate our readers and facilitate this conversation while sharing our favorite magical tales and products with you and your little ones every month! We hope to plant the seed for a love of literacy and learning in your baby’s life. A FREE 8-pack of Once Upon a Farm fresh, organic, chilled food pouches delivered right to your doorstep! (within US 50 states) Promo code allows you to select the flavor of your choice from www.uponafarm.com. The January Snackn Story Giveaway will begin Thurs, Jan 19. Contest ends on Mon, Jan 23 at midnight PST. Open to US residents within 50 states, 18 or older. Six winners will be announced/tagged on Tues, Jan 24 on the original Instagram post. Winners will have 48 hours to reply with their contact information. If a potential winner does not reply within that time frame, a new winner will be selected with 48 hours from that day to reply.